There is something magical about bruschetta. 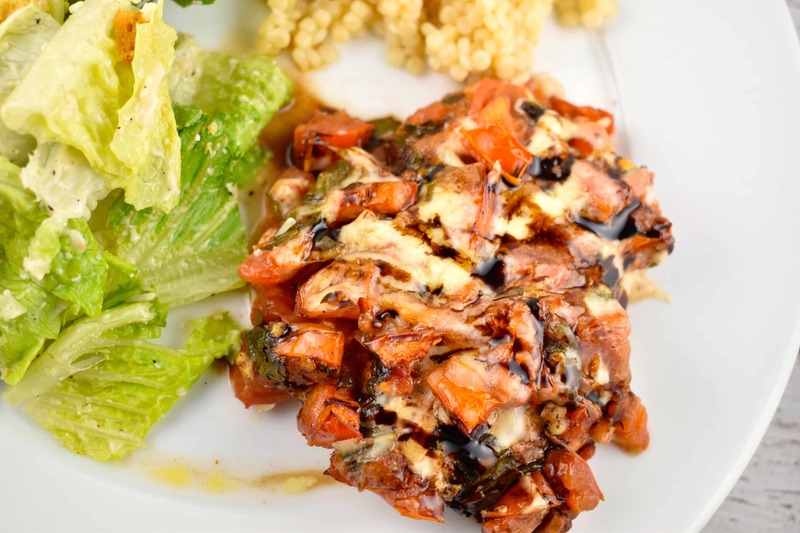 The flavors of the tomatoes, basil, garlic and balsamic vinegar is enough to make your taste buds sing. One of the downsides of bruschetta is that it’s usually an appetizer that is served on bread. While appetizers are great, they’re not very filling and when you eat more than a piece or two, you end up using a lot of points on the bread. Points that you’d typically like to use for something else. So, I decided to turn this traditional appetizer into a main dish. The first thing that I had to do was get rid of the bread. An entire meal served basically as a sandwich wasn’t going to work for me. Instead of bread, I used chicken breast to serve the bruschetta on. Boneless skinless chicken breast is very low in fat and calories and has a mild flavor that goes perfectly with the rich and juicy tomatoes, basil and garlic. The chicken will soak up some of the juices of the tomatoes and vinegar during the cooking, so it turns out moist and delicious. Using fresh basil and tomatoes in this not only means that the whole dish is more juicy and flavorful, but it’s also more nutritious. The fresh ingredients have more nutrients than their preserved (whether canned or dried) counterparts. Of course, they’re also more interesting to prepare. Make sure your knife is sharp to cut the tomatoes or use a finely serrated knife to make the task easier. Layer the basil leaves on top of each other and then roll them into a bundle. Chiffonade, or thinly slice them to make them smaller and allow them to be incorporated into the whole dish without being overpowering in one bite. They’ll also be easier to eat (there’s no delicate way to try and get that entire leaf into your mouth). The tomatoes, basil and garlic add the traditional flavor to the bruschetta, but for me, it’s the balsamic vinegar that really ties it all together. The vinegar is rich and dark and adds a depth to the whole dish that really takes it to the next level. I didn’t want to miss out on the mozzarella, either. The mozzarella really puts the final, perfect touch on the meal. The reduced fat mozzarella keeps the calories, fat and points lower, but shredding it on the top and then melting it is perfect. It helps to hold all the tomatoes and basil on each chicken breast and allows you to indulge without going overboard. Bruschetta is a traditional Italian antipasto, or appetizer. It’s typically a grilled bread that is seasoned with olive oil and garlic then served with various toppings. The most popular of the toppings is tomatoes, basil, garlic or onion and mozzarella cheese. The different regions of Italy have different toppings for their bruschetta. The Abruzzo region serves it with a salame, often in a paste spread, that is used to help salvage bread that is about to become stale. In Tuscany, it’s usually served plain (with just the olive oil and garlic) to showcase the oils. Try this classic Italian antipasto-turned-American-main dish. You’ll love the flavors and you’ll especially love how easy it is to prepare! WANT MORE ITALIAN RECIPES? TRY THESE! Turning a popular appetizer into a light and wholesome meal. Just a few simple, fresh ingredients and you’ve got a healthy dinner that is quick, easy, and downright delicious. Preheat oven to 400 degrees. Cut chicken breasts into 4 cutlets, and arrange evenly in a baking dish. Combine tomatoes, basil, garlic, olive oil, vinegar, and salt and pepper in a medium sized bowl. Pour evenly over chicken breasts, using a spoon or spatula to spread it out. Place in oven and bake for about 35 - 40 minutes, or until chicken is cooked through. The tomatoes, will release a lot of liquid while cooking, carefully drain out most of this liquid. Then sprinkle the mozzarella cheese all over the top, and return to oven for another 8-10 minutes, or until cheese is bubbling. OPTIONAL: Garnish with fresh basil and a drizzle of balsamic glaze before serving. I made this last night and it was definitely a keeper. Next time I am going to reduce the cooking time, since they were a little dry. Overall, a great recipe. Even my picky 7 year old liked it. Made this last night, it turned out so great! Do you think you could sub canned petite diced tomatoes if needed instead of dicing the roma tomatoes fresh? i know fresh is best but sometimes it’s nice to use what’s on hand. I haven’t tried it myself, but I’m sure you can. The texture and taste won’t be exactly the same, but it should work. If you make it this way, come back and let us know how it worked out!